The Shelton kids grew up on lager, and our go-to beer at the dinner table as children was the quite-dry Piels Real Draft. Poured from Dad’s 33cL bottle straight into two-ounce un-tilted Dixie Cups for maximum head-retention, “PRD” (just kidding, people used real words in 1970) was, to our young unjaded palates, effervescent, full-enough-bodied, and brimming with what would later be identified as hop flavor. Though we eventually became semi-famous for personally bringing stuff like Lambic and Cask Ale to a wider U.S. audience, in the backs of our minds the word “beer” has in some way always been synonymous with a crisp, straightforward, drinkable golden quaffer with an agreeably subtle bite of bitterness. As they used to say, a “good drinking beer.” Today, as the SBs hack and slash their way through the craft beer sales wars armed with the necessary bludgeoning weapons of our time (imperial quadruple stouts and triple-sour XXPAs), we still like to wind down after each battle with a nice, cozy lager. And we’re certainly not alone. Here are some of our new and old favorites from around the world. Though our amici at Italy’s Brewfist have in the past featured products with craft-worthy names like Bionic and Fear, at heart they’ve always been champions of drinkable, balanced, and accessible beers. 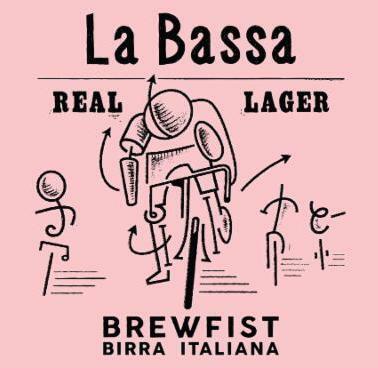 After many years of challenging the might of the industrial giants with offerings of IPA and stout, they now go to the heart of the matter with their full-circle 5.2% La Bassa Real Italian Lager. From the brewery: “We come from a land of vast fields, morning mist, and unsung heroes called La Bassa. La Bassa means past traditions, strong values, and our own heritage: a real lager.” Hey, they feel the same way we do; they just put it more poetically. What we both agree on is that this is the first real “craft” alternative to Italian lager giants like Peroni, and it’s actually delicious. Like lager should be, in every country. Brewfist La Bassa is available in 24/330mL cases. The Americans helped bring lager brewing to Japan back in the day, and, thanks largely to Yank expat Bryan Baird, have also overseen the craft beer explosion there. Having produced more than a decade’s worth of beautifully made ales in his adopted country, Bryan draws upon his solid beer upbringing and training in the USA in creating the 5.5% Numazu Lager, about which he says: “Most people associate the word ‘lager’ with beers mass-produced by large industrial breweries — light, crisp, and refreshing, but not terribly flavorful. A lager can be more than that, though. Numazu Lager is crisp and refreshing, but also rich in flavor and complexity … a true throw-back lager.” We are on the same page with our countryman. Baird Numazu Lager is available in 24/330mL cases and 20L PubKegs. Our first import, back in 1996, was Cantillon Lambic. But we were just as excited about the beers that followed — traditional Franconian lagers. Drie Fonteinen Beersel Lager is available in 24/330mL and 30L kegs. Not our (or your) father’s beer, but it’s also a brave new world of lager out there. Way Beer Amburana Lager is available in 12/310mL cases and 30L kegs.